Coming to 15 weeks tomorrow, I am super thrilled though extremely exhausted. I will be meeting my gynae again tomorrow for him to explain the results of the scan. I feel that I have strained myself bad these past few weeks. The nature of my work has taken its toll on me and my body. Taking care and teaching a class of 15 three-year-olds is no joke. Especially when they misbehave, run around and get to your nerves everytime. Since this is childcare, we, as teachers even have to shower them, clean their poo, clean their vomit, change their diapers, wash their hands, feed some of them, make milk for their naptime, carry, lay out and wipe their mattresses, help them with their beddings, pick up pieces of food on the floor after them, wipe the tables, stack up the chairs APART from teaching them, disciplining them, nurture their growth, taking care of their safety, play with them and the list is neverending. Oh I forgot to mention, looking after the hearts of their parents, updating their parents verbally and through e-mail, showcase their artwork, write documentation, do observation, plan for countless centre events, go for endless meetings, prepare their work folders to show their parents during Parent-Teacher Conference this week. So there you go.... that is just the tip of the iceberg. Not to mention the one and a half hour journey to and from work which I have to go through by smelly and sweaty public transport. I dunno how much longer I can keep up with this now that I have a growing baby inside me. It is not a wonder that I seem to feel strain in my tummy and my back everytime I bend down, sit down and stand up countless times, raise my voice and do all those chores as stated above. My tummy is now seen to be jutting out very clearly already and though commuters can easily tell I am pregnant, they will just shut their eyes and sleep in the MRT. It's like an eye disease. Like a special kinda cyclops who cannot see pregnant woman, straightaway must shut their eyes. Whatever, I dun mind standing unless I am really unstable, then I will ask for the seat. Oh well, I am not gonna waste time anymore, i have tons of work to do (on a Sunday) to prepare for the parent-teacher conference this week. I can't rest in this cool weather. =( I hope to just chop chop finish it and catch up on my sleep later. Until the next update, which I hope will not be a rant. I just need an avenue to let it out. Thanks for reading. 50,000 bloghits as of today - Thank you. Finally a long update. 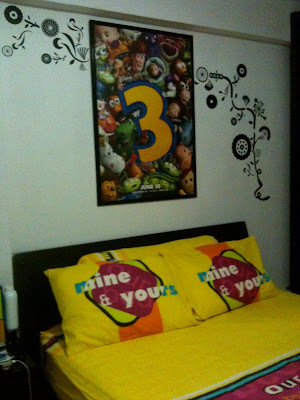 OOooo we have changed the poster to our room too. I went into a poster buying frenzy and bought 2 original posters - 1 US double-sided teaser and 1 original double-sided poster. But we're not putting this up due to its value. So, on a lighter note, guess which movie poster is on our bedroom wall now? Bought this teaser just because it looks cute with all the characters inside! 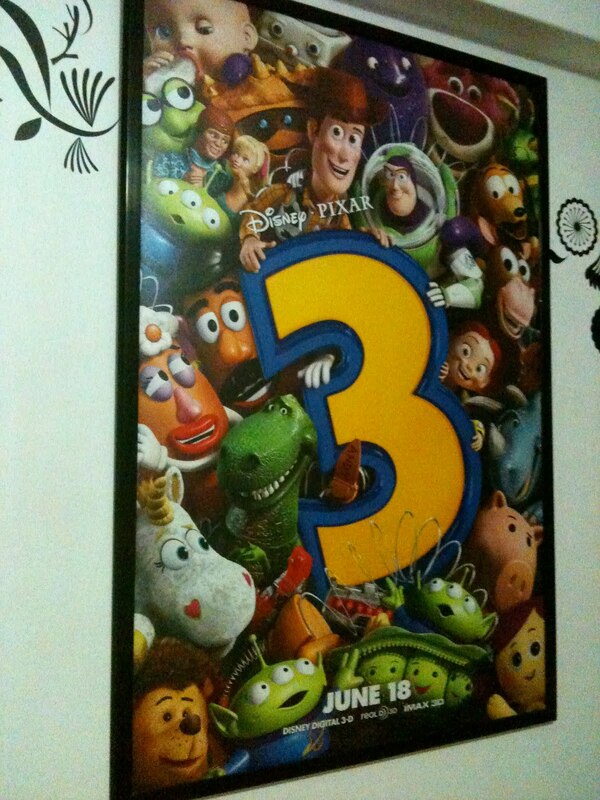 Of course the Original Toy Story 1 fetches a much higher price but i decided to forego that. Princess day on my birthday!! Shopping Spree sponsored by the loving husband. Clothes, clothes and more clothes!! I have overturned my wardrobe big time and threw out 2 humongous recycle bag of unwanted clothes. Our theory is simple. NO WAY am i gonna waste money on maternity wear. Might as well get dresses (short, boho, long, sundress, etc) which can be worn during and after pregnancy~! Chic and practical. Hubby also got me this watch! =) I have not been wearing a watch or keeping track of the time for a whole lotta months already. Thus this is a perfect watch for a Hot Date or a night out. 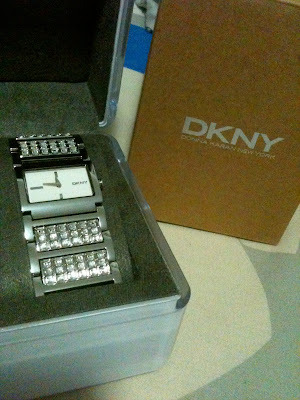 =) Thank you dearest Hubby, you pamper me so well! My aunt just got back from LA and she got us these for baby! 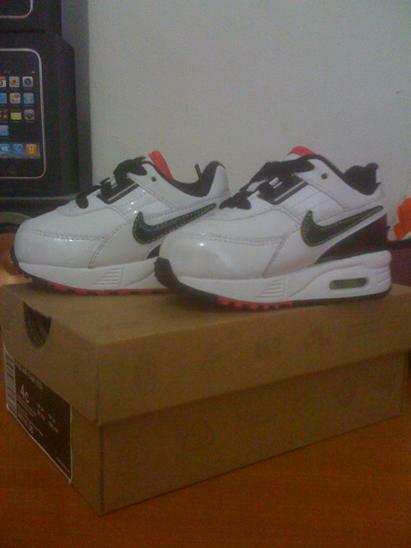 Nike Air Max! Black white pink! Like father like child. hehe! Everything is in its perfect place. Alhamdulillah.